A smile makeover is the process of improving the appearance of the smile through one or more cosmetic dentistry procedures. 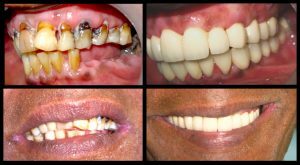 What are the considerations to plan a smile makeover? A smile makeover takes into consideration your facial appearance, skin tone, hair colour, teeth (colour, width, length, shape and tooth display), gum tissue and lips to develop an ideal smile. Smile makeovers are performed for many reasons and customized according to one’s unique considerations. A beautiful smile can have numerous effects on an individual’s self-confidence, self-esteem and personal relationships. While a smile is an extremely important attribute, a beautiful smile will make one seem more attractive. What is the life of a smile makeover? Cosmetic dentistry procedures require regular oral hygiene care and may require maintenance over time. For example, teeth whitening must be repeated on occasion in order to maintain brightness. Porcelain veneers may chip or break off and need replacement. Permanent composite bonding may stain and require enhancement or replacement. Dental crowns typically require replacement after 10 to 15 years. Gummy smile improvements may also require enhancement over time. What are the different smile makeover procedures? These procedures are done when extensive treatment is not needed and can be done in a single visit. The most common procedures that can be done are for changing the colour of stained teeth or minor repair of chips, cracks or spacing between teeth. Chipped, broken, or discoloured teeth may be repaired or have their appearance corrected using a procedure called composite bonding. Teeth are often stained from smoking, food, drink (coffee, tea or red wine) or poor oral hygiene. Bleaching the teeth can enhance the appearance of your smile. What are the improvements in technology for smile makeovers? Even a perfect smile can be enhanced with tooth jewellery. Tooth jewels add a sparkle to the smile. The range includes 22 and 24k gold, 18k white gold, brilliant cut diamonds, swarowski crystals in various shapes and colours. The procedure involves bonding the jewel onto the tooth. It can be removed/changed by a dentist easily.